Colonel David Meyer was honored with the Distinguished Graduate award for Public Service at the ceremony on November 20. During the ceremony, Meyer talked to the freshman students about his experiences in high school and gave them wise advice about how to dig deep and be great at what you love. Meyer also talked about the opportunities students get as they grow up and the great life habits they can learn in high school. He spoke about his life now and how he sometimes reminisces on his teenage years. Linda Meyer, David’s mother, is very proud of her son. After the ceremony, Meyer and his guests visited two classes before attending the luncheon catered by Frisco’s with the rest of the honorees. Meyer first visited Mr. Burch’s American Studies 2 class. 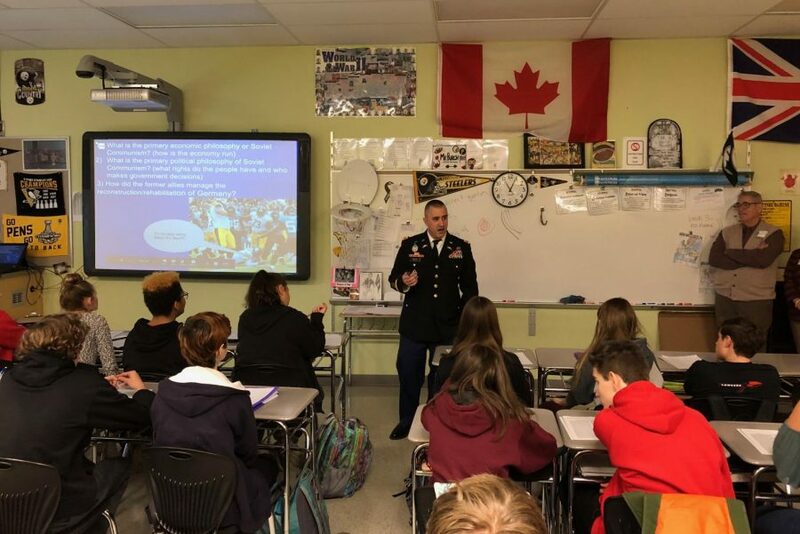 Since Meyer has been in the military for 24 years, he gave a first-hand view of what the students are currently learning in class. Meyer also was available to answer questions. Meyer then visited the journalism class. There he spoke about his specific jobs in the military and the reasoning behind his choice to join the army. Meyer gave exceptional advice for students to use going forward. “Being dependable is your number one goal,” said Meyer. One thing in particular that Meyer talked about was how it feels to be back at Linganore. He remembers a lot, but a lot has changed as well. Meyer talked about his perception is very different but he’ll never forget his high school. “Linganore is a place I remember fondly, but it’s not my place anymore, the last time I was here was 28 years ago,” said Meyer.